HOW OFTEN DO YOU GET A CHANCE TO PURCHASE OFFICIAL TOUR SWAG FROM THE GREATEST LIVING ESCAPE ARTIST? Greatest Living Escape Artist Michael Griffin has started releasing in limited quantities vintage tour merchandise from his earlier shows around the globe. As an interesting aside, according to Griffin, while on the road it is not unusual to be presented with old items he wasn’t even aware of including a just found early VHS tape showing his escape from a trunk of a car waiting for another car to be dropped on it. 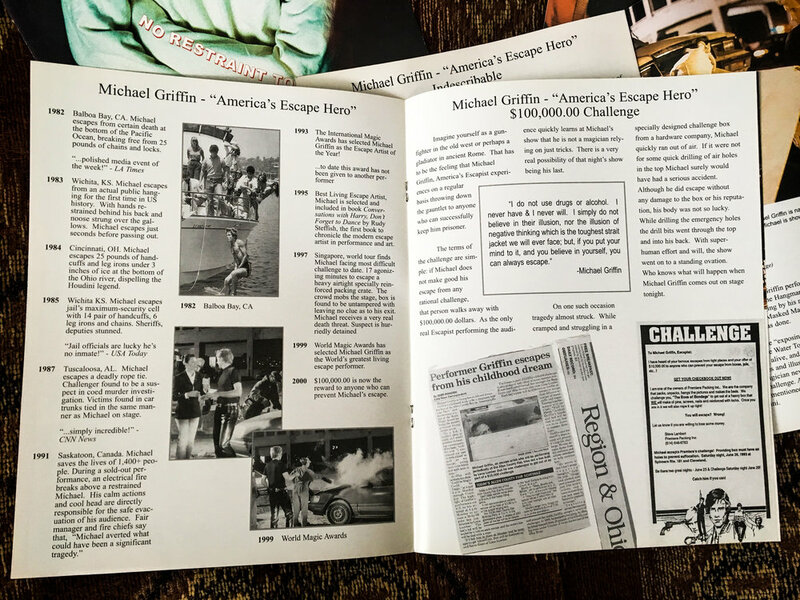 If you have any old Michael Griffin Escape Artist items take a pic and send them to us, we’d love to see them and tag you with them. Performing astonishing escapes and setting records around the World for over two decades, 2-time World Magic Award Winning Master of Escape, Michael Griffin is considered the Greatest Living Escape Artist. He is the ONLY escape artist to ever survive a hanging on the back of a horse with thirteen-knot Hangman’s Noose in 52 seconds! What’s the secret? It’s Griffin’s strong mind, conviction, heart, and belief. “I do not use drugs or alcohol. I never have and I never will. I simply do not believe in their illusion, nor the illusion of negative thinking which is the toughest straitjacket we will ever face; but, if you put your mind to it, and you believe in yourself, you will always escape”. Information about Michael Griffin can be found at www.escapeguy.com. A BIG BANG: ESCAPE ARTIST TO REVISIT HIS MOST DANGEROUS TRICK FRIDAY NIGHT IN THE GUN ROOM, OUTCOME - MAGIC OR TRAGIC?